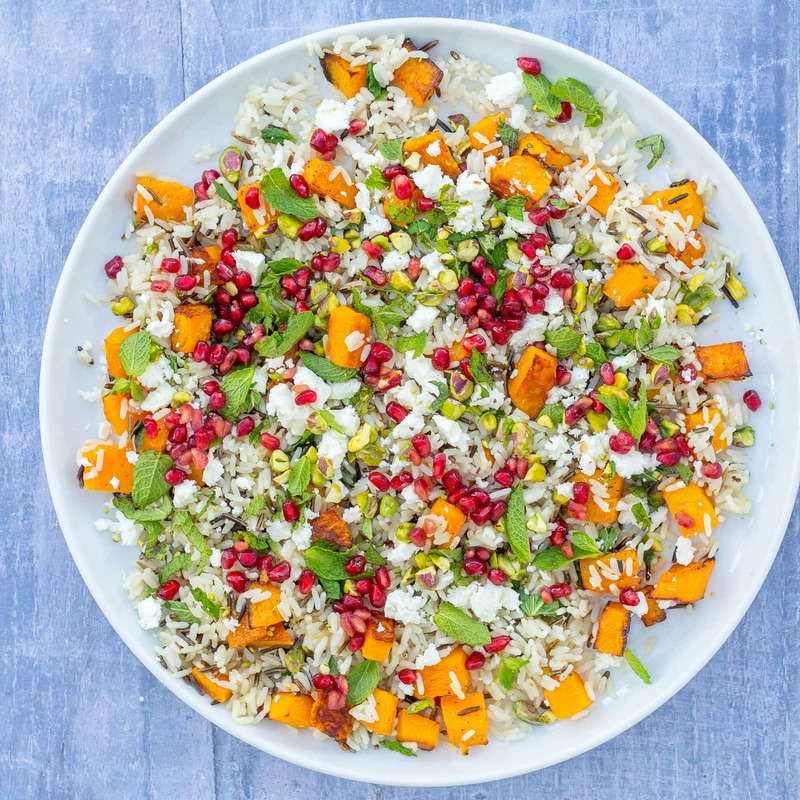 With sweet squash, salty feta, crunchy pistachios and fruity pomegranate seeds, this Warm Christmas Rice Salad is a real crowd-pleaser. It’s quick and easy to make too – perfect for festive entertaining. Plus the leftovers make an envy-inducing paced lunch the next day! I was asked a few weeks ago how I come up with my recipes and it’s a question I find hard to answer because there are so many different ways! There are some recipes which just pop into my head like my Peach, Prosciutto and Mozzarella Salad or my Broccoli, Lemon and Chilli Pasta. There are others, like my Beef Bourguignon and Easy Peasy Prawn Paella, where I have decided what I want to make and then googled lots of recipes to get ideas, before coming up with my own ‘easy peasy’ version. There are a few which are happy accidents, such as Butternut Squash, Prosciutto and Walnut Pasta. 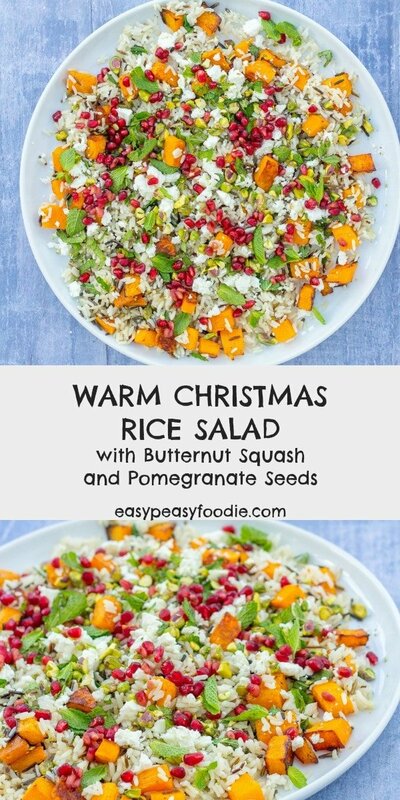 But the vast majority are born from a collection of influences – like this Warm Christmas Rice Salad. It came about partly because I wanted to do something with wild rice, partly because I am in love with pomegranate seeds and pistachio nuts at the moment, partly because I had half a butternut squash left over from making Warm Butternut Squash, Harissa and Halloumi Salad and partly because I wanted to do something that felt Christmassy but that didn’t involve turkey, parsnips or sprouts. 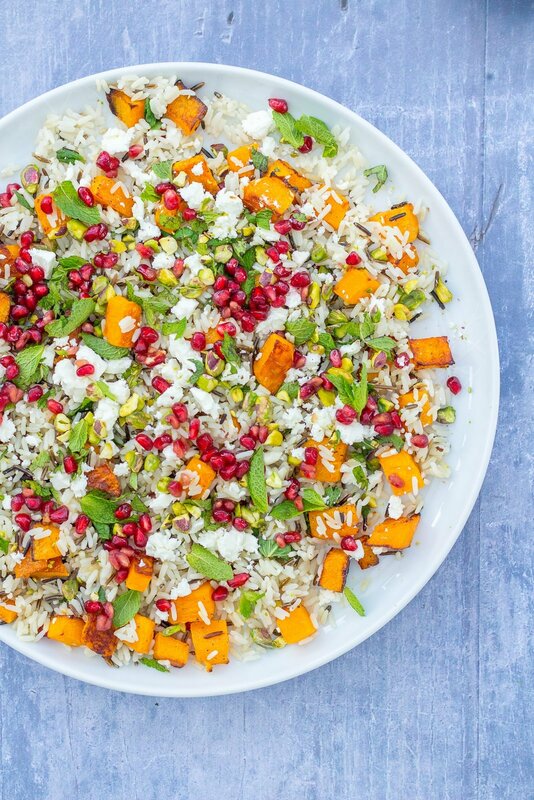 The result is this delicious warm rice salad that oozes joyous festiveness, but which is also completely different from the usual Christmas fayre. As I mentioned above, part of the reason this salad came about is because I wanted to use wild rice. I’ve been quite inspired recently by the likes of Jamie Oliver and his book on superfoods and blogs like Deliciously Ella, which promote eating more wholegrains as being healthier and more nutritionally dense than their white, processed counterparts. As a result I’m trying to include more wholegrains in my diet. Plus I just think wild rice looks so pretty and tastes amazing. I found a packet I like from Tesco, who stock a mix of Tesco Easy Cook Long Grain And Wild Rice. It’s already partly cooked, so it doesn’t take long to cook, tastes really great and looks so pretty in this salad. To keep things simple (this blog is not called easy peasy for nothing! ), I used ready-prepared pomegranate seeds and pre-shelled pistachio nuts. These are obviously a little more expensive than buying a whole pomegranate and shell-on pistachios, but they do make this salad really quick and easy to put together. Another little trick is that I make the salad in the roasting tray, which helps to keep the salad warm and also minimises washing up. To simplify even further you can of course serve the salad straight out onto plates, but I love the theatre of a big platter of this salad in the middle of the table for everyone to help themselves. 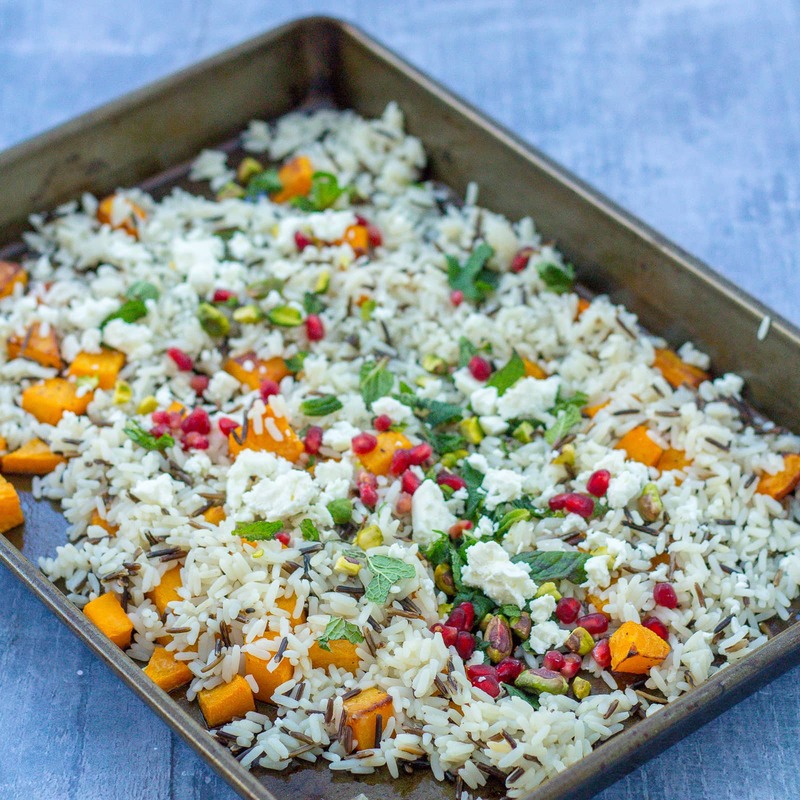 I like to serve this jewelled Christmas Rice Salad warm, but it tastes great cold the next day too and is a good one to make an extra quantity of for packed lunches (my husband had a few jealous colleagues when he took this in for his lunch). It would also be a lovely unusual dish to take to a Boxing Day or New Year’s Day buffet or pot luck affair. Alternatively it would make a good ‘light dinner’ on Christmas evening – and the leftovers would go brilliantly with the cold roast turkey etc. the next day. This recipe produces a generous amount for 4 people and is really easily multiplied for larger crowds. This dish is vegetarian and gluten free and is really easy to adapt to make it vegan and dairy free too by leaving out the feta. Or you could swap the feta for half a tin of drained kidney beans. 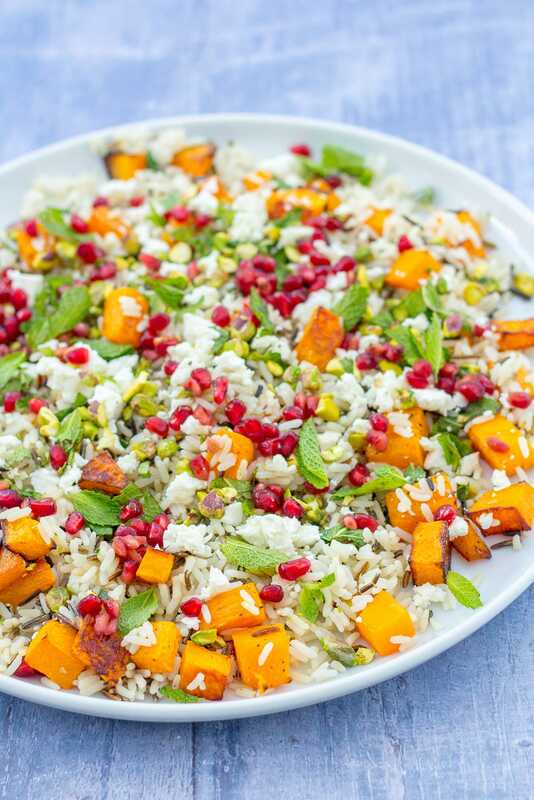 This Christmas Rice Salad would also make a great stuffing to fill aubergines, red peppers or a pumpkin – ideal if you are having vegetarian guests at Christmas. 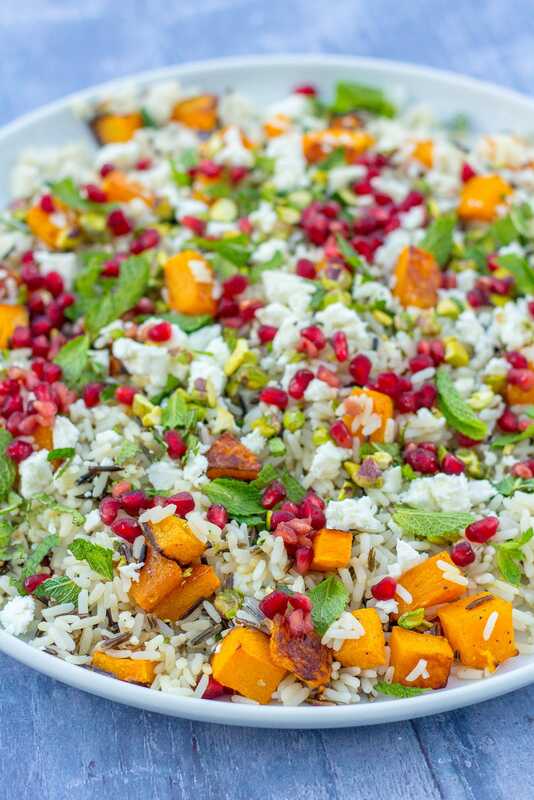 I would serve this Warm Christmas Rice Salad with a New Zealand Sauvignon Blanc which pairs really well with the bright flavours in this salad. Drizzle a roasting tray with about 2 tablespoons of olive oil. 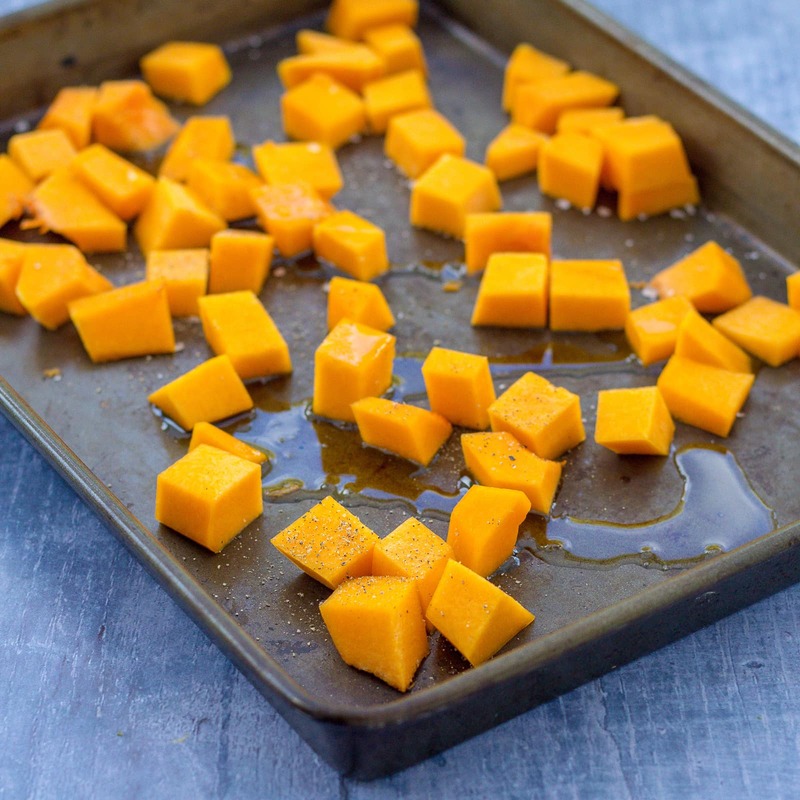 Put the butternut squash cubes into the roasting tray and turn in the oil. Make sure the butternut squash is spread out in 1 layer. Add a little salt and pepper to taste. Put the butternut squash in the oven for about 20 minutes until soft. Meanwhile cook the rice according to packet instructions and then drain the rice thoroughly. When the squash and rice are ready, tip the rice into the squash tray. (Be sure the rice is thoroughly drained before you do this.) Squeeze the lemon juice into the tray and add a drizzle of extra virgin olive oil (about 1 tablespoon). Add roughly half the chopped mint, pomegranate seeds, pistachio kernels and crumbled feta and mix everything together. Turn out onto a serving platter and scatter with the remaining mint, seeds, pistachios and feta. What a lovely festive salad! I think it would be great with some leftover turkey on Boxing Day. Thank you so much for linking up with #CookOnceEatTwice again. It looks wonderful, so colourful. It’s a lovely dish. What a lovely combination of flavours – sounds delicious. I’m definitely the sort of person that buys pre-chopped butternut squash. Peeling and chopping squash is one of my least favourite kitchen prep jobs. I had no idea you could buy frozen chopped squash, I’ll definitely keep an eye out for it next time I shopping. This sounds so delicious Eb. 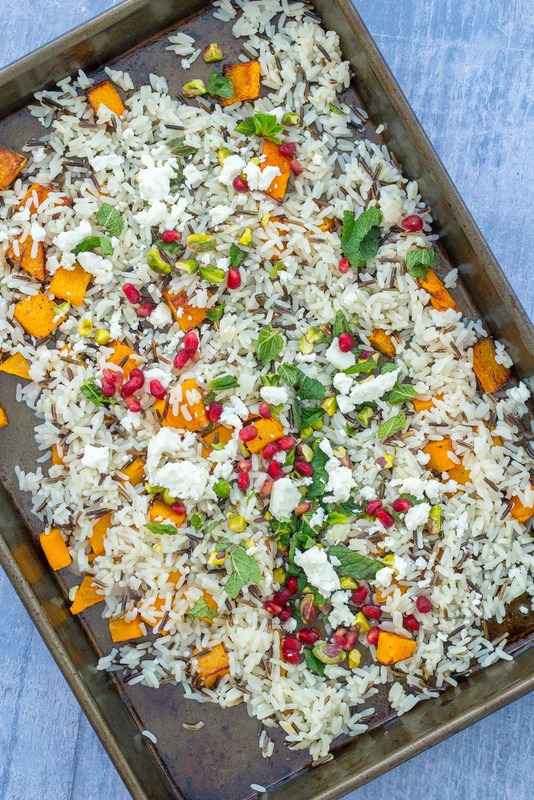 It’s right up OH and my street – we adore feta and butternut squash. Pinning for the new year when we will no doubt be needing something a little healthier! What a beautiful and very colourful salad Eb. Full of al my favourite things….. 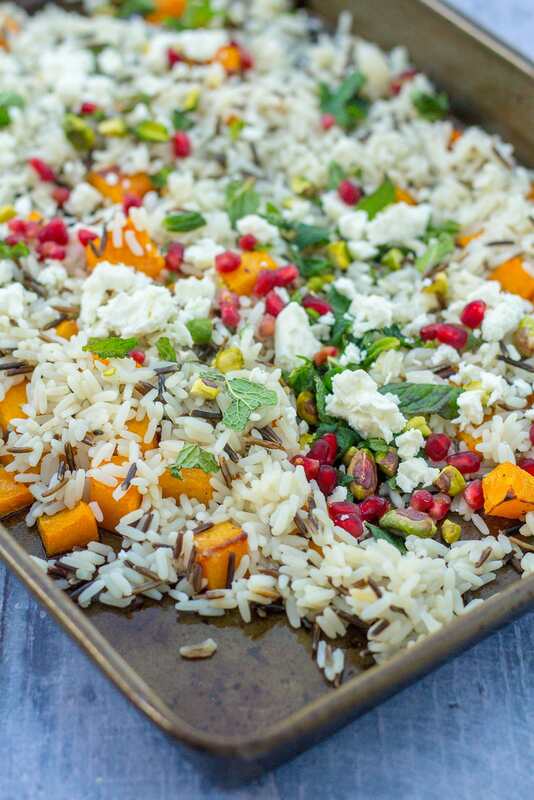 I love roasted butternut and am particularly drawn to your addition of feta and mint in this dish…. Warm salads are particularly lovely at this time of year and I could happily eat a bowlful of this one! This is such a colourful choice for Christmas and much lighter than everything else that’ll be on offer which I love! It’s going to go down particularly well with the veggies at Christmas dinner too! This recipe sounds delicious and looks really pretty too – so colourful! Wild rice is great for salads as it’s got that lovely chewy texture. I will definitely have to look out for some as it’s a while since I’ve had it. Thanks for sharing with #CookOnceEatTwice! I love salads with rice and squash, but mine are just simple! Yours looks so exotic. A colorful, festive and tempting salad. Such a treat for the eyes. I’d love to have this just not during the festival but any time of the year.